in money? in a job? Maybe there is clutter & craziness all around you? It could be your home is perfectly ordered and clean but something doesn’t feel right? Something is out of balance and you feel it. Energy is the thing we can’t see but we feel and you can trust your feelings about energy. Your intuition is leading you somewhere good. That part of you that senses imbalance wants to find balance. The part of you that feels chaos wants to find harmony. I also know you don’t have ladies-in-waiting taking care of everything for you. Clutter builds up & mess is magnified. Work can get busy and you have little inspiration for bringing any kind of magic into your home. and all the clutter and chaos would magically disappear? Wouldn’t if be awesome if someone would just TELL you what to do? Someone who could lead you step-by-step thru clearing and cleaning and organizing and making your home or work space feel AMAZING. Or maybe just one small space feel amazing…baby steps seem to have been my way to harmony. Imagine the moment when you figure out your home is mirroring something in your life and you just want to know how to change it. AND you have access to ME! Someone who can help you figure that out and then guide you to change it. Did you know you can harness the power of your home to create change? Your home can be a CATALYST for change and it can be good! 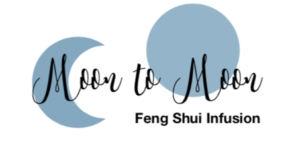 Moon to Moon Feng Shui Infusion! The way Moon to Moon Feng Shui works is through the power of intention, the magic of the moon and modern practices of Feng Shui. You learn techniques and knowledge. I provide support for you to create spaces that live and work for your greatest good. You’ll focus on creating spaces that stimulate you to create change in the world if that’s what you want! And your intention creates the most amazing changes. With guidance, you can channel your intention and make it super powerful and brilliantly magnetic. Your energy is magic so let’s bring it into your home and create a home that fuels your life! I will help you infuse your surroundings with MORE….more love, more light, more order, more meaning, more harmony. It’s only one month and we can do A LOT in one month. That means I’m there with you doing the course LIVE. It’s not a self-study course. I am there to answer your questions. you can do that right now, right here if you like! Because you get to create your own password, I recommend making it an amazing one! Use the power of repetition during log-in’s to set yourself up to call in brilliance and success. Create a password that lets you feel your dreams and wishes have ALREADY happened. Once you’re in to the course website, you can join our private Facebook group too. This group is friendly and full of surprising facts regarding the Science Of Intention. I post encouraging things and interact with YOU. I might even ask you questions. I will always share AMAZING science about the power of intention AND how amazing and magical YOU innately are. You can ask questions in the group and you have live access to me there if you want it. Then, during the new moon, an email arrives and announces that the New Moon phase has arrived. I love beginning this work during a new moon. We seem to have access to our internal world in a way we sometimes do not during a full moon. So beginning this process by becoming quiet and still is soooo lovely. Every week you receive an email that invites you to the next week’s offerings. Thank you so much Susan, I just spent time today watching the videos, printing your handouts, writing my wishes and dreams…feeling good! I’ve set up your welcome to be simple. Just step in and get started. My mind looks for that gap and obsesses over how to build the bridge. I’ve set up this course so you can begin with ease. This week your body, your mind and your spirit are influenced by the energies of a new moon. I will lead you through space clearing and clutter clearing and I’ve written a Feng Shui starter guide for you. This week you shift into a healing energetic that supports you leaving your old shell behind. This is an energetic shell that you’ve likely developed over time and it’s keeping you from expanding into your own life! The thing that has had you feeling trapped will be affected and it will begin to change. You will feel the tentacles of the past begin to relax. Your home helps to keep you stuck in this energetic so by relaxing and engaging consciously with processes designed to do this….you will find it easier to make changes in your environment. The waxing moon can give us energy. So I will provide energy healing processes for you. Tao is explained and extended. We will continue to fill your cup and empty out what is no longer needed. Our work this week re-connects you with your own internal voice. YOU are not your home. Your home SERVES you. You are the master. How much time do you need for all this? Take less than an hour to watch the videos and do the quiz. There is a checklist to keep you organized. If you do the energy clearing work, it will take more than an hour…and you can do it everyday or just once. Whatever you choose is PERFECT. By the end of this week you will be ready to make bigger shifts in your space. For me those bigger shifts always look small but for some they really are big. And what’s a Bagua Map? …oh…yes…we will learn what that is this week! I’ll give you maps and widen your perspective. This week you will want to take action and make changes and take risks and try some things. That’s usually what happens. Your residual feelings will be of freedom, fullness, spaciousness and expansion. You might feel your brilliance is growing. That’s how powerful it is to make shifts during the full moon! Your body, your brain, your brilliance….all will be puzzling it out, letting go, recreating, actively moving. I’m so glad you’re here doing this with me! Waning Moon and the Magic of the Feng Shui Superheroes! Your spidey senses have been nurtured these past 3 weeks and you are ready to bring the magic of the waning moon into your home. Every room can heal your life and I’ll take you step by step through the elements so you can bring them into every room of your home (if you want to). This is a week of EXPRESSION! You are new again and your creativity is bubbling up. It only took a few weeks and you’ve removed stagnant, stale energies and items and arrangements and ‘things’ out of your personal space. This is where we reflect on our power and magic and step into the new moon again. You will have accomplished something beautiful & meaningful and you will have been your own healer. Your intuitve being has received nourishment. You have more trust in yourself. You might even want to come back and do it all again! Lucky for you, your investment in this e-course gives you lifetime access to future rounds of Moon to Moon. You are invited back again for the next round of Moon to Moon Feng Shui! You are now part of our tiny, growing community…ooolala how fantastic is that! You are welcome to use the checklists each week. They are created to make this a step by step process. All the pdf’s are downloadable. Did you know that writing on your pdf’s by hand helps you access a different part of your brain? Your thought process is altered and may give you a more grounded experience with the material. My original training and career was as a classroom teacher. I did that for 10 years before leaving. I founded and ran my own private arts school for 20 years after that working with infants through adults, and doing therapeutic work through music and movement. I’ve worked as a teacher trainer, at colleges and travelled to speak and facilitate workshops around the country. I LOVE to teach! What I know is that it’s much easier to learn from video when the information is delivered in bite-sized chunks. I decided to host this course on it’s own site because I could make it look prettier that way. And honestly, if you are someone who has registered for a Feng Shui course you likely have a predilection for beauty. So, I made it lovely and vibrant for you. Wow! I love it when that kind of stuff gets dealt with around the house! I am just starting to read your handouts for this week, and also doing some reflection… I had a humid sunroom with condensation on the windows at the beginning of the course, and now have an attractive, modern dehumidifier that works perfectly & efficiently, and solved the problem beautifully. Thank you for creating this course and initiating these changes ☺️! Just wanted to tell you how much I loved your course content and feel you have done an amazing job creating your videos & PDF’s!!! Your voice, presence, and knowledge have been so encouraging. I feel like this course came into my life at a perfect time for me, and have already recommended it to one of my best girlfriends. you may increase your income thru combining specific intention to do that with powerful feng shui and space clearing work taught in this course. I’ve done it.